You may have noticed some activity at the new Bish Discovery Center on Ohio Street. 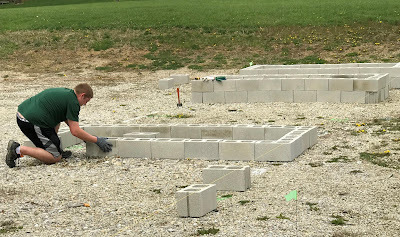 Cinder blocks and soil have been delivered to build at least 20 raised beds on the empty lot on the north side of the building. Staff and volunteers have been on site more regularly as the excitement for using this space for the community continues to grow. The purpose of the community garden is two-fold as the district looks to provide space for both individuals and school students. The majority of the beds will be available to rent for a small fee by people who would like a place to garden but may not have the space or proper sunlight at their residence. A garden contract will ensure that there is a mutual understanding between the park and the renter. Darke County Parks will provide quality soil, access to water, and video surveillance to detour vandalism. There will also be a number of opportunities to gather and learn for those interested in expanding their knowledge. The hope is to create a community of people who have an interest in gardening and a place to learn more about how to have a successful harvest. The Greenville Elementary School will be the main focus of the educational gardens in the space. The park district plans to offer curriculum based programming for classes and have the gardens available for independent field trips and lessons as well. While the focus will be on kindergarten through first grade in the beginning, it is expected to include all of the grade levels at the elementary school in the future. Darke County Parks is proud to be the recipient of a grant from RAB Lighting to get this project off the ground. Along with the community garden there are plans for rain barrels, aquaponics, a compost area and cold frames. For more information or to sign up for programs please call 937-548-0165.